33-year-old Aida* has two sons, aged six and 10. She was diagnosed with multi-drug resistant tuberculosis (MDR-TB) in 2016. After four months of in hospital, Aida was released to outpatient care, but the side-effects of her treatment made taking public transport each day deeply challenging. 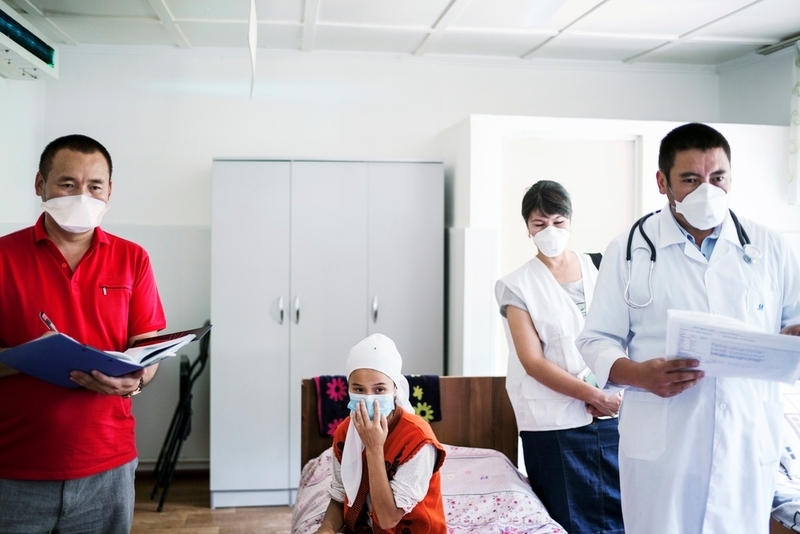 As an alternative, Aida was offered video-observed treatment to help her continue her treatment without the necessity of daily visits to the MSF clinic. On 28 November 2018, after nearly two years of battling with MDR-TB, Aida was told she was cured. “I had many side-effects from my MDR-TB treatment. I felt like my body was rejecting the medication. I had headaches, stomach aches, vomiting. When I was put on outpatient care it was really hard for me to go to the directly-observed treatment (DOT)** corner every day by public transport to get my medication. Sometimes after leaving the DOT corner I would feel dizzy on public transport; I didn’t recognise people and would lose my sense of direction. There were times when I would miss my stop and wouldn’t know where I was. I was losing my mind. I wouldn’t even recognise my own home. So I decided to stop the treatment. I told my doctor that I could not do this anymore; I couldn’t go through this every day. I said, I’d rather die at home peacefully, than die on public transport. The doctor asked me if I would like to start video-supported treatment instead and I agreed. MSF gave me a smartphone that had the WhatsApp messaging app installed on it. The nurse would give me enough medications for one week. Every day I would have a video call with the nurse and would show her that I was taking the drugs. I started feeling a little bit better. I didn’t have to leave the house every day to go to the DOTs corner; I didn’t have to take public transport. I would take the medication; eat well and lie down a little. After I started the video-supported treatment, it got easier. I still had side-effects from the medication, but they were less severe. It was easier to handle them. I felt like I could finish treatment now. I told myself I need to get better and get over it. The MSF team undertake the daily check-up of patients at the Kara-Suu hospital. Kara-Suu. File image. When doctor told me that I was not sick anymore, I cried with happiness. When I told my kids they were so happy, they hugged me tight and said “Finally!”. Now I am cured I’m trying to help my kids more, his teacher said that my son had changed. She even asked me if I had hired a tutor, but I just started helping them and being more attentive. I am helping with chores and trying to be a better mother. I missed out on so much, but now I am helping them with homework, I am starting to be able to do something. ** Directly-observed treatment (DOT) is a method of drug administration where a health care professional watches a patient taking each dose of a medication. DOT is used to ensure the person receives and takes all medications as prescribed and to monitor response to the treatment. DOT is widely used in the tuberculosis treatment.